This is one of my favorite websites I use to design graphics for my blog, social media websites, and more. – It does not save any photos you have uploaded, so you must upload photos each time, which is time consuming for someone who is always adding their logo etc. If you stumbled upon this video and you are ready for a change, please find me below! This is awesome! I love that it’s so creative and FREE! I’m also loving that you can create a jpg or a png file! Thanks so much. Hey, how do you upload your own font? Too low resolution, I can’t watch clearly on my PC. 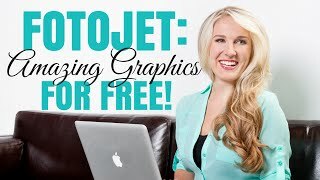 How does fotojet turn pictures into different shapes? Do I have to drop it in a preset shape or is there a way where I can insert a shape? If you upload more than one photo, can you decide which photo goes Forward or back? Glad I watched this. Something new for me to play with thanks!